CHICAGO, IL—Fifty years after Martin Luther King Jr. was assassinated while working to launch a Poor People’s Campaign to address the needs of low-wage workers, certified nursing assistants at Mado Buena Park in Chicago were joined by charter school and City Colleges of Chicago workers as they celebrated MLK Day by launching an unfair labor practice strike early this morning. The strike is the first of a wave of three planned strikes in the Chicago area in coming weeks, with charter school workers represented by Chicago Teachers Union having set a strike date of February 5th, and with Tony Johnston, president of the union representing City Colleges of Chicago workers, announcing at this morning’s strike line those workers’ intention of beginning their own strike on February 4th. 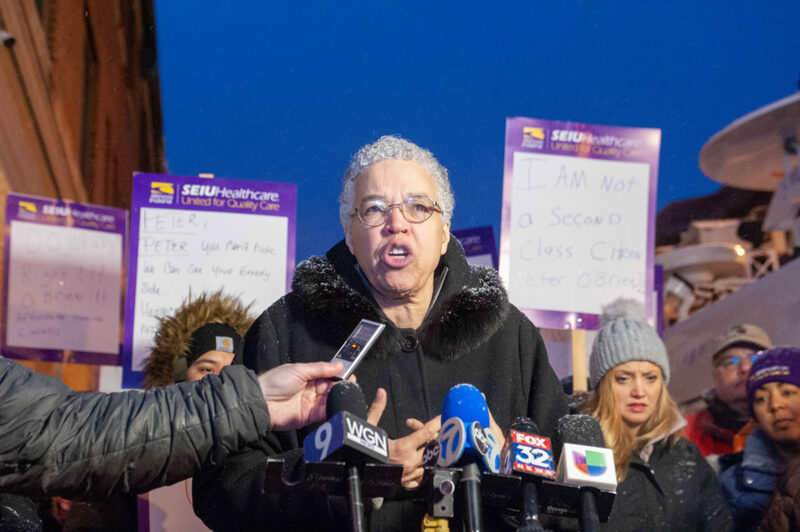 Striking Mado Buena Park workers were cheered on by Cook County Board President and mayoral candidate Toni Preckwinkle at a press conference in front of the facility this morning. The Mado Buena Park workers launched their unfair labor practice strike to stand up for fair treatment on the job. They are protesting management’s illegal surveillance of union activity and the illegal implementation of management’s last offer in bargaining. Additionally, workers are demanding affordable healthcare and a living wage in line with the standard industry wage for the Chicago area. 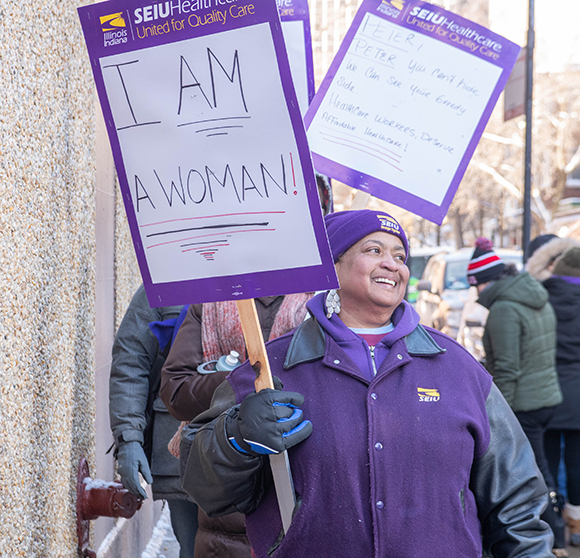 Roslyn Branch, a striking certified nursing assistant with nearly 40 years of experience, spoke this morning about the challenge of accessing and paying for healthcare on her wage of $12.15 an hour. She previously paid for health coverage through her employer, but the plan was too expensive and required her to pay too much out of pocket. Jen Conant, a teacher at CICS Northtown Charter School who plans to walk the picket line outside her school on February 5th, found common ground with Mado Buena Park workers. At the close of the press conference, strikers and their supporters returned to the picket line with their signs and chants making their demands clear—an end to management’s unfair labor practices, including illegal surveillance and the illegal implementation of management’s last bargaining offer, and a fair contract that includes fair wages and affordable healthcare.